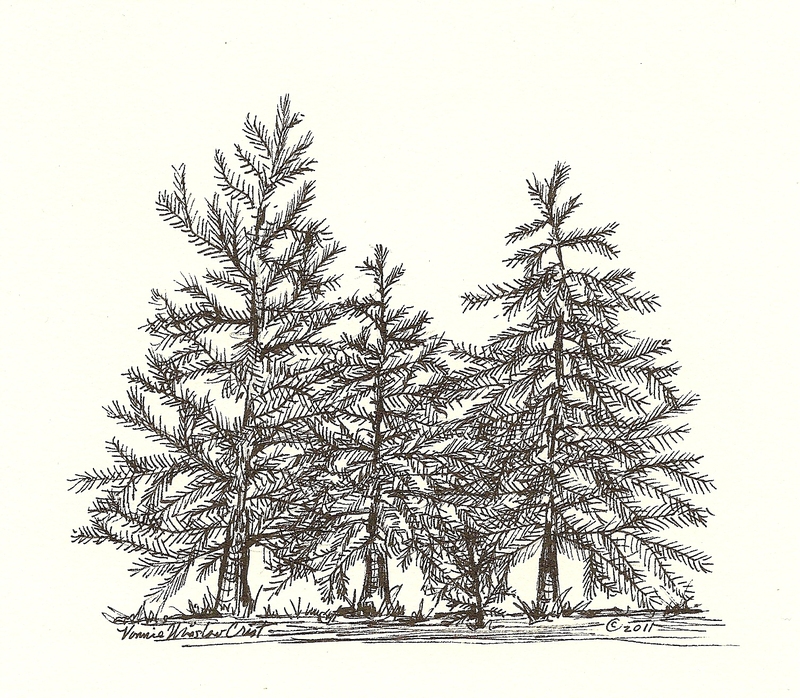 As another ice storm approaches Wood’s Edge, I haul seed out by the bucketful to the wild birds perched on the branches of the trees and shrubs at the forest’s edge. Even with coat, hat, boots, and gloves, I shiver. I glance up at the heavy gray sky before filling the feeders. The chickadees, juncoes, wrens, cardinals, blue jays, red-winged blackbirds, sparrows, nuthatches, and tufted titmice (titmouses?) bravely swoop down and clothespin themselves to the perches of nearby feeders as I fumble with the first suet basket. Crows caw from the fence rail, several woodpeckers hop down the tree trunks, and a solitary hawk watches the goings-on with much interest. 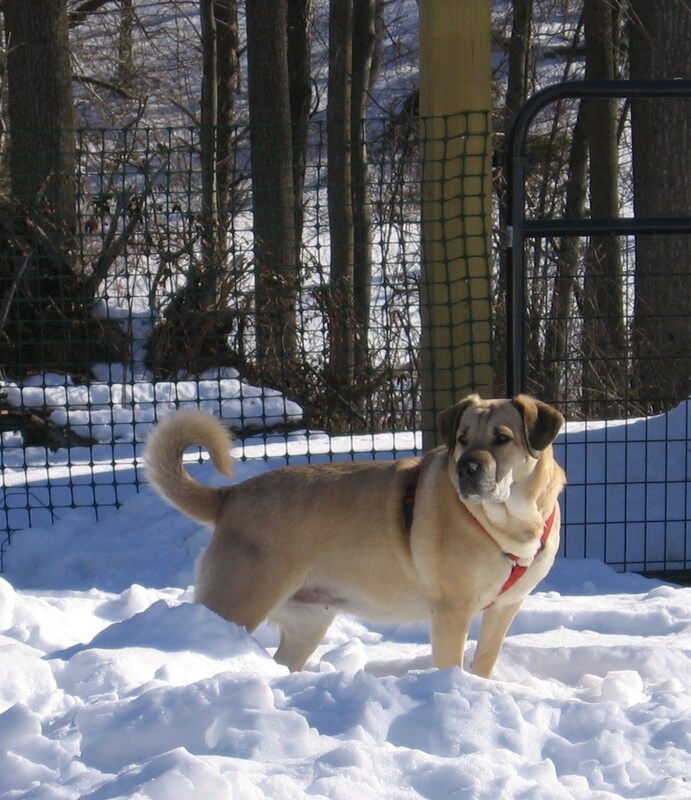 Meanwhile, Sandy the Black-mouthed Cur is bounding through the drifts, grabbing mouthfuls of snow, and rolling with abandon in the loose, fluffy snow in the corner of the yard. Joyful is the only word to describe her behavior. 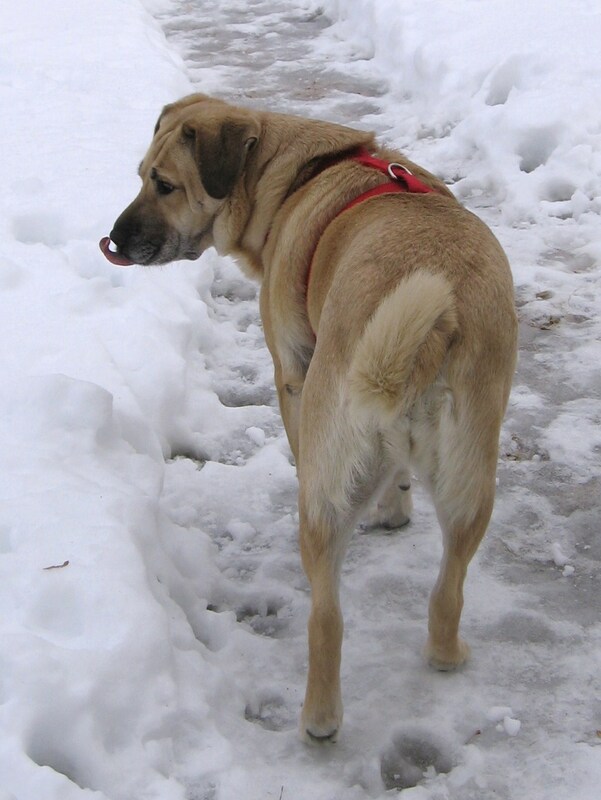 She looks at me, eyes bright, muzzle whitened by snow, tail wagging so hard the rear half of her body has joined its back & forth motion, and woofs. A playful woof that seems to say: The world is wonderful and isn’t it great to be alive! Last winter seemed to be a long string of snowstorms. This winter appears to be much the same. I get lots of writing and drawing done it’s true, but I miss morning walks. 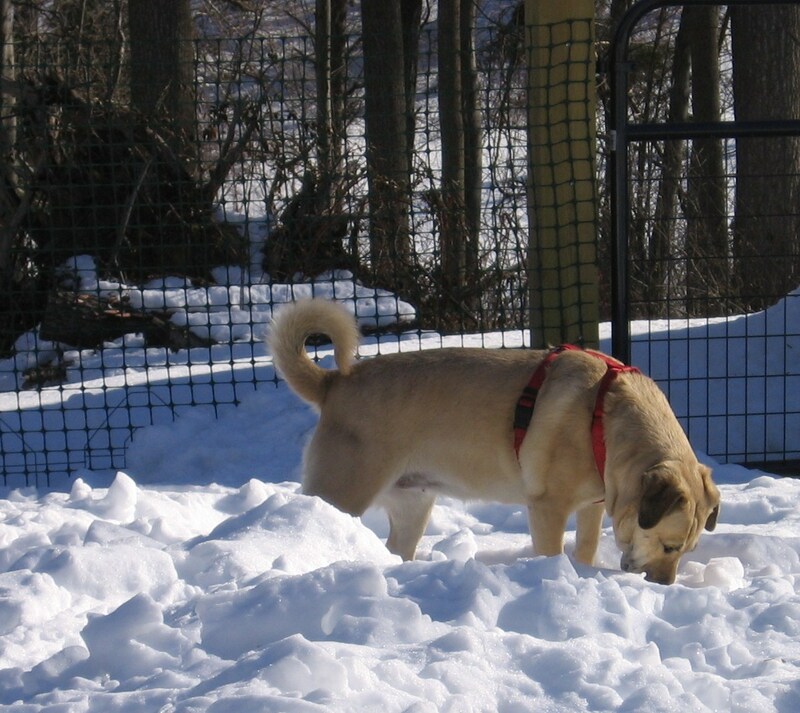 Ice is not something I choose to tread upon when trying to manage an enthusiastic 60-pound dog. And tonight we expect more ice. But even as I cringe at the thought of another month of bad weather (and I suspect we shall get another month’s worth of frozen precipitation whether or not that famous Pennsylvania groundhog sees his shadow) — I think of crocuses and the sound of spring peepers. And since Sandy has only been with me since last June, I secretly wonder what she’ll think of frogs! And so, I share a quote from Anne Bradstreet: “If we had no winter, the spring would not be so pleasant.” Indeed! 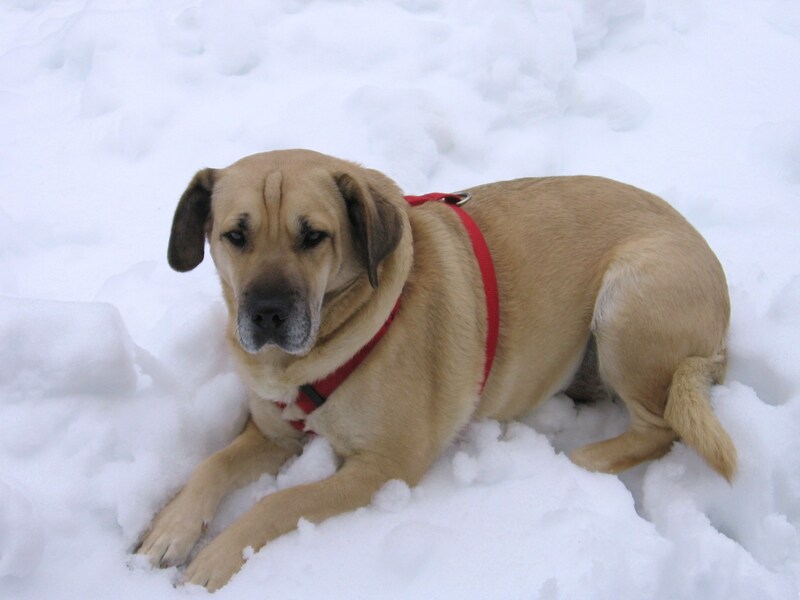 And if we had no winter, Sandy the Black-mouthed Cur would surely miss the snow. Bells, a new eShort of mine has been published. It’s a Christmas ghost story, and I promise the names Scrooge and Marley are not mentioned. Bells actually includes scraps of “real” holiday memories and family members in addition to things that were drawn from my imagination. But that is often the case with fiction — writers select threads of factual experiences and actual people they know and weave them with dreams and make-believe. If the author works hard at stitching the two together, readers will have a difficult time separating fact from fiction in the resulting tapestry. And that’s what we want as both reader and writer, a lovely, seamless blending of ideas that takes us into the world of the story. 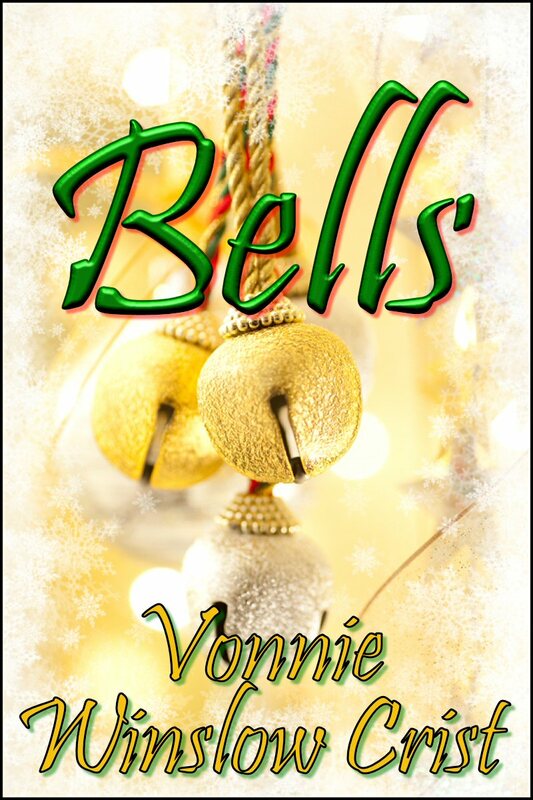 In the case of Bells, the reader is invited into the world of 17 year-old Melinda on a snowy Christmas evening at a family get-together in an old house in a small town. The 100+ year-old house on the corner of Park and Millstone Streets is filled with people, delicious foods, holiday decorations, family traditions, a love story, and ghosts. And I challenge you to determine what parts of the tale are “real” and which parts are purely the stuff of dreams! 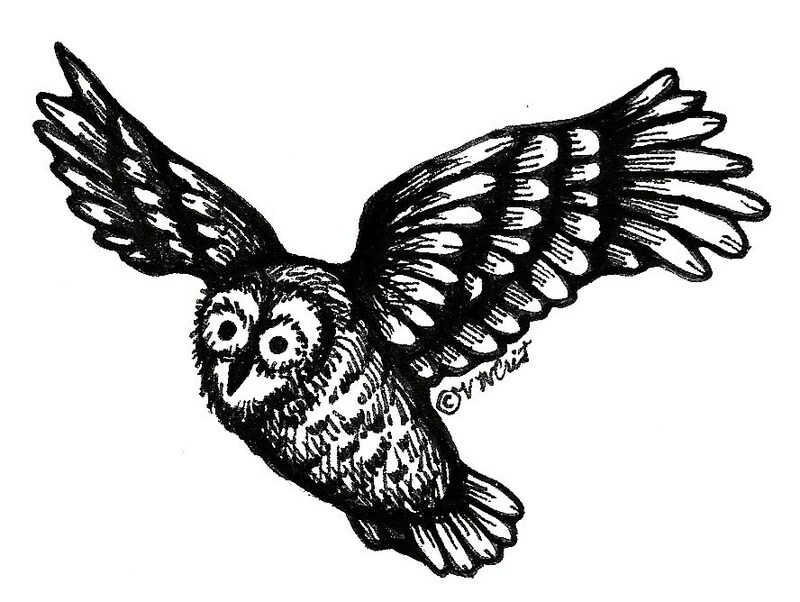 Update: Alas, Bells is no longer available as an eshort — but hooray, it’s included in Owl Light, published by Cold Moon Press.